We aim to despatch quickly. Ideal accessory to give your suit that retro 60`s look. We aim to despatch quickly. Ⓒ 2018 DQT Ltd. Plain Royal Blue Satin Handkerchief / Pocket Square. 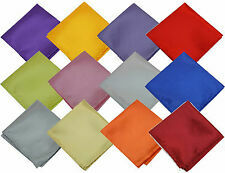 Fabric: Satin Polyester (Smooth, Glossy Finish). Colour: Royal Blue. Wash Care: Dry Clean Only. Size: 29cm x 29cm. Ⓒ 2018 DQT Ltd. Paisley Purple Handkerchief / Pocket Square. Fabric: Woven Microfibre. Colour: Purple. Wash Care: Dry Clean Only. Size: 27cm x 27cm. Ⓒ 2018 DQT Ltd. Polka Dot Navy Blue Handkerchief / Pocket Square. Fabric: Woven Microfibre. Colour: Navy Blue. Wash Care: Dry Clean Only. Size: 27cm x 27cm. 1 - 1/4" Red/White Gingham and 1 - 1/8" Red/White Gingham Pocket Square / Handkerchief. Ideal accessory to give your suit that retro 60`s look. We aim to despatch quickly. Hand printed pocket square handkerchief or neckerchief. Made from 70% wool 30% silk. Hand printed in England. Green background with large spot pattern print in brown and pink. Purple border. Hand rolled edges. 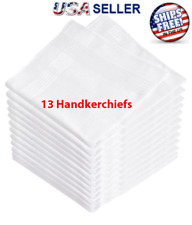 Two white with embroidered Shamrock Motif, 100% cotton.Handkerchiefs. 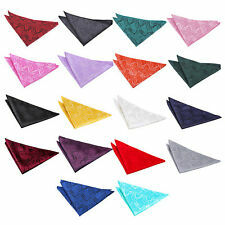 1 quality 100% cotton pink polka dot handkerchief / pocket square. We aim to despatch quickly. 1 quality 100% cotton aqua blue polka dot handkerchief / pocket square. We aim to despatch quickly. Pocket square, depicting Terrier Dogs. Burgundy brown colour with blue border.Hand rolled. Made from 70% wool 30% silk. Printed in England. Ideal accessory to give your suit a Scottish touch. We aim to despatch quickly. Ideal accessory to give your suit that retro 60`s look. Colour - Pink Check. We aim to despatch quickly. Ideal accessory to give your suit that retro 60`s look. Colour - Navy Blue and White Check. We aim to despatch quickly. Ideal accessory to give your suit that retro 60`s look. Colour - Green and White Check. We aim to despatch quickly. Ideal accessory to give your suit that retro 60`s look. Colour - Royal Blue and White Check. We aim to despatch quickly. Ideal accessory to give your suit that retro 60`s look. Colour - Yellow and White Check. We aim to despatch quickly. Ideal accessory to give your suit that retro 60`s look. Colour - Black and White Check. We aim to despatch quickly. Ideal accessory to give your suit that retro 60`s look. Colour - Blue and White Check. We aim to despatch quickly. 100% pure cotton material. A great gift product for family and friends. Colour as shown in pictures. 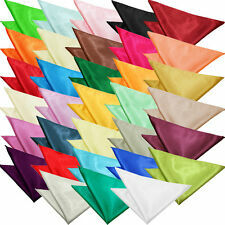 Includes 6 colour shades in cellophane bag. Linen pocket square handkerchief in blue with orange and turquoise flower heads. Brown hand rolled border. Made in England. Hand rolled edges. Made in England. NAVY BLUE SOFT SILK POCKET SQUARE HANDKERCHIEF. Care label : MADE IN ENGLAND. PURE SILK. DRY CLEAN.